A book that has sentient dogs... after reading the blurb about the book, my first two thoughts were, look's good and sentient dogs, ah, that reminds me of the Tines from Vernor Vinge's A Fire Upon the Deep. The Tines are the dog-like species who live on the planet the main storyline is set, they are a medieval culture and as individual dogs not sentient but when in a pack they are a single sentient being, I wonder if Wagner will take this route? It's very interesting premises and a book I highly recommend you read, A Fire Upon the Deep. However back to, An Oath of Dogs, the plot looks good and it's reminiscent of Vinge and Cameron's Avatar. Looking through the editorial reviews it looks like Wagner has written a book that is not only a good read but also one which will make you think, and to me that's good science fiction. Have you read it yet? I'd love to know what you thought. All of Wendy Wagner’s stories feature a rare and precious element: tremendous heart. 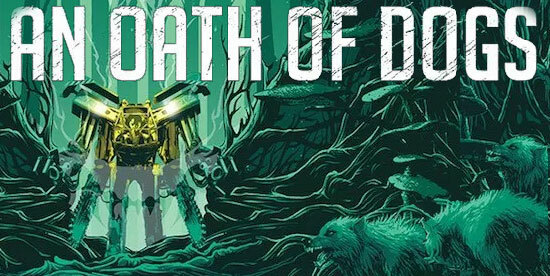 An Oath of Dogs is an excellent example of this – with an expansive SFF universe, exploration of philosophy, theology, and issues right at the heart of what it means to colonize a strange world. Wagner’s characters are compelling and true. An Oath of Dogs combines echoes of Vernor Vinge and Sherri S Tepper with Wagner’s own unique vision for the planet of Huginn and those who are trying to survive the planet, and each other. Kate Standish has been on Huginn less than a week and she s already pretty sure her new company murdered her boss. But extractions corporations dominate the communities of the forest world, and few are willing to threaten their meal tickets to look too closely at corporate misbehaviour. The little town of mill workers and farmers is more worried about the threat of eco-terrorism and a series of attacks by the bizarre, sentient dogs of this planet, than a death most people would like to believe is an accident. When Standish connects a secret chemical test site to a nearly forgotten disaster in Huginn s history, she reveals a conspiracy that threatens Standish and everyone she s come to care about.